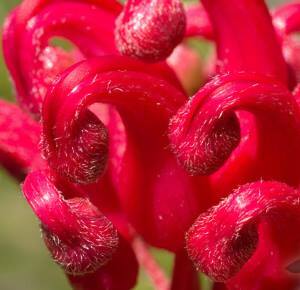 A local customer asked me to post my ten most favorite plants for these creatures. She also asked me what Butterflies we have out here. (HUH?) Guess I have to admit that I only know the most common. I would love to hear other peoples nominations for nectar sources, as well as the butterfly and hummingbird specie we have. Note our hummingbirds arrived about two weeks ago, with the blossoming of Indian Plum and Ribies. While 320 different species of hummingbirds live in North, Central and South America, only 20 grace the United States and only 20 grace the United States although the Southeast area of AZ may sometimes have some vagrants showing up. WA is not well blessed in number and most of them can be found in the Southwest. In Washington, however, we can catch glimpses of the Rufous and Anna’s Hummingbird west of the Cascade Mountains, and the Rufous, Calliope and sometimes the Black-chinned Hummingbird east of the Cascade Mountains. 1. Anna’s Hummingbirds, closest to being a year-round resident. 2. Rufous Hummingbirds, arrive in their breeding territory in Washington at the end of February until the end of April (mostly March). They mostly nest in the mountains. From August / September, they migrate south to Mexico and Central America for the winter. 3. Calliope Hummingbirds, occur from March to August. Mostly nests in the mountains. They migrate south or east for the winter. 4. Black-chinned Hummingbirds, Archilochus alexandri – Native Breeder – Black-chinned are the least common of Washington’s breeding hummingbirds. RARE. Please note some of these plants may be for shelter or nesting as well as for food, and some of the same plants attract butterflies. 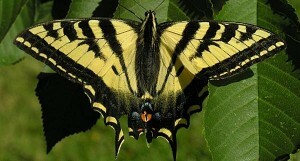 THE FOLLOWING LIST IS FOR BOTH BUTTERFLY AND HUMMINGBIRDS POPULATIONS. NARROW IT DOWN. Redder colors usually attract more hummingbirds! Vines: Campsis (Trumpet Creeper) Morning Glory, Scarlet Runner Bean, Campsis (Trumpet vine) Lonicera japonica and sempervirens, Tecoma capensis (Cape Honeysuckle). (For Butterfly Larva, many of the above) Aster, Asclepia, Broccoli-Cabbage – Mustard family, Rue, Hop vine, Passion Vine, Wisteria, Spirea. Trees: Acacia, Madrona ? ?, Malus esp. the pink or red flowering forms. Eastern Redbud – Cercis canadensis, Cercis, Hardy Eucalyptus, English Hawthorn esp. the red varieties. Maple treed acer including our native species, Melaluca (NOT HARDY), Red buckeye hybrids such as Aesculus x carnea, Catalpa and Chltalpa esp.tashkentensis Chitalpa tashkentensis ‘Pink Dawn’ or ‘Morning Cloud.” Chilopsis (Not Hardy), Citrus (Not hardy), Red Buckeye – Aesculus pavia, Silk Tree – Albizia julibrissin Short lived and marginal here. Strawberry Tree – Arbutus unedo. A personal favorite of mine. Tulip tree – Tulip poplar A hardy and very huge tree. 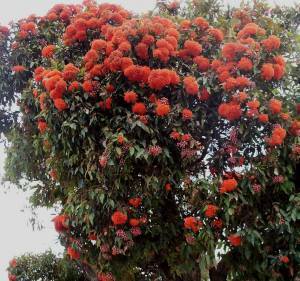 I am sure they will also visit any red flowering tree. In Santa Cruz Eucalyptus ficifolia and the shrub Grevillia family were always overwhelmed. Echium vulgare This may just be a good bee plant! As a hummer footnote. Always remember that these winged wolverines are fierce carnivores as well. 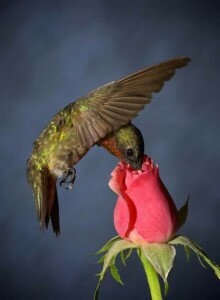 Using pesticides eliminate many of the small insects that hummingbirds love to devour. Placing a water source is also of prime importance. Another footnote. Using pesticides around hummingbird plants is a very bad idea. Killing garden pests will also eliminate the small insects hummingbirds rely upon for protein. Aside from their ingesting the pesticide toxins, just think would you eat those plants yourself after spraying them? I think not. Footnote on bugs: Like the mason bee there are many small wasps that feed on, or parasitise small insects such as aphids. Someday I will do a post on these creatures. Instead of a 5/16 inch hole, you use a fast drilling bit of 7/64 dimension. The size is is important! A friend just made me one, but didn’t have a bit that could make a clean hole, so he used the next size up. We will see! These are only my top favorites. If you would like me to post your own additions, let me know. Please note, this area in WA state is a Zone 8 and this list is for that hardiness zone. I could easily name many tropical s or plants that are grown in Florida or California, but this is basically for this climate zone. The green highlights are not for certain but bees like them, as they do most of these plants. Other plants that are favorites would include the wildflower Indian Paintbrush, but as they cannot be transplanted or even encouraged into the garden I have left it alone. 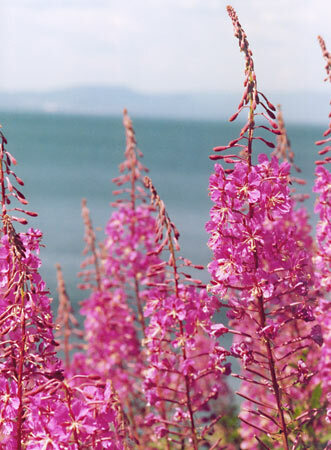 BTW – Epilobium (fire-weed) makes for a poor mans asparagus when harvested as young shoots with small leaves. YUM! In wild gardens, it must be carefully checked and confined. I just got some nice feedback from Gaberham Lincoln who has a nice site on Google. He gave me some nice feedback and mentioned the bleak weather and that he had to conjure things out of memory. Same with me. I also forgot the weedy Viper’s bugloss (Echium Vulgare) and our native fire-weed. Now I need to go back and edit. Clover, by far the best is crimson clover.and did if forget the hyssop. If I did I deserve a kick in the rear end. Russian sage, phlox. I left out the milkweed, but you correct they certainly attract butterflies, but I ended up doing maintenance and no-one would pay the gardener who left such a weed standing. I would also say that many of these plants are bee plants as well, so I can’t vouch for the echium one but they do work the fire-weed, which by the way makes for a poor mans asparagus when harvest as young shoots. YUM!